TOLEDO -- Wait, hold on. I thought they said real rock 'n' roll was dead. Try telling that to the 30,000 or so true believers from the whammer-jammer generation who gathered here Sunday evening to participate in one ferociously liberating tribal stomp. Pass the decibels, please. Victory through volume! 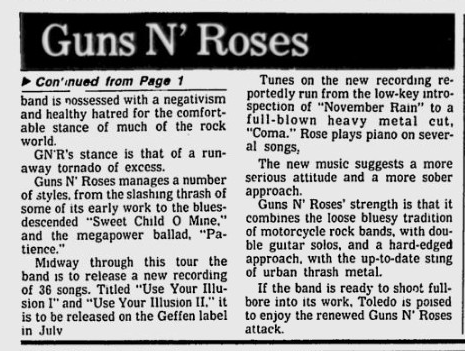 You see, absolutely everything was coming up Guns N' Roses. Geeked on primal beat temptation and amped way outta their party-loving minds on the mud, the babes (both male and female) and the beer, thousands of Midwestern rockateens gathered to pay howling homage to the proud, unrepentantly loud metallic sounds of singer Axl Rose and the rest of the Gunners' sonic- boom brigade. Call it Woodstock for headbangers. Only instead of Max Yasgur's farm, it was the tattered, down-home Toledo Speedway that supplied the appropriately sloppy and free-spirited setting for this raucous Rust Belt blowout. Two straight days of hard rain had turned the Speedway's infield and the surrounding parking areas into a swampy mess. But by Sunday afternoon, with the sun out and the sky gone blue, even the yucky muck became just another rock 'n' roll party accessory. Well, maybe more than an accessory. Traffic was jammed early and often, with cars stretched out miles from the Speedway, down the I-75 exit ramp and back to the Michigan line. But were concertgoers having fun yet? You betchum they were. This was a rowdy human zoo of revelers sporting ripped denim, black leather and profane T- shirts ("Die Yuppie Scum! "), hyped up on the heavy excitement of grand expectations. Guns N' Roses, about to unleash two albums in July, their first new recorded music in three years, is undertaking its first major tour as a headlining act. 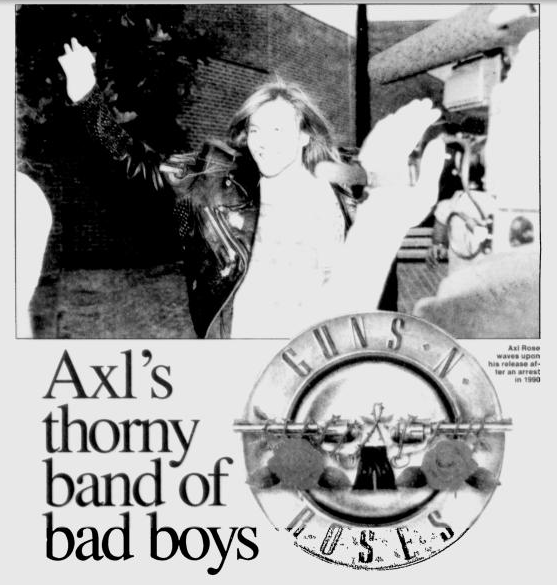 This isn't just another gang of MTV-bred hairspray celebrities to the millions of fans who bought the group's incendiary 1987 debut album, "Appetite for Destruction." This is a band that really matters. Led by politically incorrect Axl Rose's cosmic caterwaul on such intense, raving anthems as "Sweet Child o' Mine" and "Welcome to the Jungle," Guns N' Roses soars out there on that reckless edge of hard-rock inspiration occupied in the past by the likes of Led Zeppelin or the Rolling Stones. Of course, their place in backbeat history will have to wait. Besides, Sunday night wasn't about cerebral contemplations of artistic merit. This was about the essential boogaloo truth: Shakin' all over makes you feel good all over. A generally friendly, well-behaved crush of youthful thousands had a grand time bouncing around to the electrical vibrations. The high-energy opening act, Skid Row, curried audience favor by leading obscene chants of ridicule for such imagined pop culture musical poseurs as Bon Jovi, Nelson and Vanilla Ice. The main spectator sport? Why, rooting for the dozens of tanned young women in provocative halter tops and seated atop the shoulders of astonishingly sturdy male companions to flash some bare breast. And, in the spirit of good clean, safe sexual fun, they regularly obliged. Yes, there were the usual rock concert casualties: taste, decorum, moderation. And for some -- the ones who had too much sun, too much beer, too much testosterone or too much of all three -- there was the early exit, courtesy of muscular security guards. Fret if you must, but it goes with the territory. And like it or not, rock 'n' roll at its most enjoyable and its most liberating has a certain touch of giddy madness. Hey, isn't that Axl introducing a Paul McCartney song? "Live and Let Die"?! No way. Way!!!! Well, the life-affirming, celebratory madness was everywhere Sunday night. And with inferno-fingers Guns N' Roses guitarist Slash leading brilliantly raw trips into the mojo ozone (including a positively molten jam on the theme from "The Godfather" ?! ), even a live-wire middle-aged rockateen felt like he was knock, knock, knockin' on nirvana's door.